Friends, the new year has arrived. The planet slowly tilts its northern hemisphere back toward the sun. Though day-light hours begin lengthening, the long, evening shadows still arrive early. The land, still bare; the branches still leaf-less. The earth still sleeps—and will for some time. There’s been no major storm, yet, no deep New England freeze, yet; though we brace ourselves for the cold, wind and snow we know from experience are coming. The mid-winter holidays have almost passed—the Christian celebration of Epiphany, Three Kings Day, Twelfth Night happens this Tuesday. We settle now into the winter season (though, admittedly, some of us never settle). Winter is—at least in New England—the cold season, the still season, the blue season, the fallow season, the empty season. Winter is the season for solitude, hunkering down, self-care, rest, healing and hot chocolate. I shared with you earlier a passage from Barbara Kingsolver’s 2007 book, Animal, Vegetable, Miracle, which for me begins to describe this winter stillness, this hunkering down, this solitude. She says, “at the moment I had the house to myself. My sole companion was the crackling woodstove that warms our kitchen: talkative, but easy to ignore. I was deeply enjoying my solitary lunch break, a full sucker for the romance of winter, eating a warmed-up bowl of potato-leek soup and watching the snow. Soon I meant to go outside for a load of firewood, but found it easy to procrastinate.” Yes, in winter our regular lives continue. 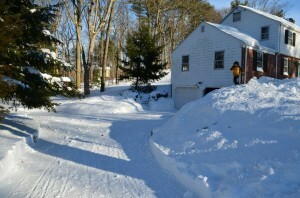 Yes, there is plenty of outdoor activity in winter—sledding, skiing, skating, snow-boarding. Yes, some of us never settle into the season. But the cold, wind and snow do urge us indoors to the warm fire-side, to the hearty soup, to the moment of solitude. I assign spiritual qualities to the seasons. I imagine winter as the season for the sustained, inward look, the honest self-examination, the probing self-reflection. I imagine winter as the womb season, the floating, sleeping, dreaming season, the season for gestation, for growth beneath the surface, for growth in the nurturing darkness. I imagine winter as the season for preparation, for getting ready—ready for new selves, new commitments, new directions to emerge, just as the physical, earthly winter season is the time when life gets ready—slowly—to emerge green and glorious and new in spring. The spiritual winters of our lives, which can come at any time of year, are rarely easy, but they come with promises, with opportunities for growth. Sometimes they come because we invite them—because we resolve, finally, to make a change, and we believe we are ready to do the work change requires—for example, the work of breaking habits, the work of letting go of unhealthy attachments, speaking difficult truths, leaving dysfunctional relationships, repairing broken relationships, apologizing, forgiving, following less-travelled roads. Sometimes our spiritual winters come unexpectedly and unbidden. Writer Philip Simmons speaks of our spiritual winters seizing us—sickness and its treatment, loss, death, financial hardship, losing a job. When such change comes we have no choice in the matter, no control over the timing. We must prepare for the new whether we want to or not, often very quickly. How do we prepare for change? How do we welcome the new? These are the questions of our spiritual winters. ‘Getting ready’ is winter’s work. I want to share my reflections on this work, this getting ready, this welcoming the new. And to begin, I want to discuss New Year’s resolutions, about which I feel ambivalent. These first weeks of January are famous for how quickly so many of us abandon or just forget about our New Year’s resolutions. (I made that up. I don’t know if January is famous for that, and I don’t know how many people actually make New Year’s resolutions, nor do I have any idea how many people keep their resolutions vs. how many people abandon them.) I came across a December, 2013 CBS News Poll that found that 68% of Americans didn’t make New Year’s resolutions—a sharp increase from 2011 when 58% didn’t make them. And, further, of the approximately 30% of Americans who did make resolutions, only half reported keeping them. That sounds about right. In my experience most people don’t take new year’s resolutions all that seriously. Including me. I usually don’t make a resolution unless I’m at a New Year’s Eve party where the host invites everyone to share their resolution. Then I have to scramble to come up with one, and I usually offer something vague like “I want to be a better parent.” And then everyone says, “Oh, you’re a great parent.” And then I say, “My kids might have a different opinion,” or “No, actually, I’m not. You should see me at home. I’m very cranky. I could be a better husband, too.” The nice thing—and what I mean by “nice” is “safe”—about making this kind of vague resolution at a party is that, typically, nobody will remember what I said a year later. Certainly nobody has ever asked how I’ll know when I’ve become a better parent, or a better husband or a better person. Lose weight? You can measure that. Quit smoking, drink less alcohol, get out of debt? All measureable. Or my favorite resolution from a party I attended a few years ago, “wear loud pants.” Now that’s a measureable resolution. But, being a better parent, a better spouse, a better person? Not easily measureable. How would I know—how would anyone know—when such a resolution has been achieved? And who would decide? I could become a better parent in my own estimation by raising my expectations for my kids, and they would likely hate it. Worst father ever. But I don’t want to let the practice go either. I also know that we have spiritual winters. Invited or not, they can and do seize us. Some people desperately need to make a change. Some people need to quit smoking, to get out of debt, to lose weight. Some people, myself included, long to be a better parent, a better spouse, a better person. And some people really do want to wear loud pants, not because they’re being cute or funny, but because they know something needs to change in their life: they need to lighten up, to live more authentically, to live more boldly, to be true to themselves. The pants are a symbol of a much deeper longing. So perhaps the beginning of the year is a good time to make a life-changing resolution. Out with the old, in with the new. Certainly here in New England winter is part of the calculation. Just as life recedes from the earth’s surface in winter and prepares, slowly, to emerge green, glorious and new in spring, perhaps something in us recognizes winter is the right time to do our own work of preparation, of getting ready. Perhaps the cold, the stillness, the blueness, the fallowness, the emptiness all speak to something deep in us, urging us—in our moments of winter solitude, in our moments beneath the cold January stars, in our moments warming by the fire—urging us to take that sustained inward look, to discern what changes we need to make in order to quell our dissatisfactions, in order to respond to our deepest longings. To be clear: spiritual winter is not the change itself. Spiritual winter is the season before the change: the womb-time before birth, the star-time before daybreak, the dream-time before waking, the frozen-time before spring’s thaw. Spiritual winter is the season for wondering and imagining what the change will be like, what it will feel like, how it will impact our routines and patterns. It’s the season for trial runs, for approaching the threshold of change again and again until we’re ready to cross over. It’s the season for rehearsing our lines in front of the mirror, for testing, for making mistakes and learning lessons. It’s the season for discerning what words need to be said and how to say them. It’s the season for reciting our truths quietly to ourselves, making sure we’ve got them right, hearing how they sound as they issue forth from our mouths, letting them inhabit our bodies, letting them seep into the marrow of our bones. Spiritual winter is the season for anticipating how others might react to our new lives, our new selves. It’s the season for informing those close to us that a change is coming. It’s the season for asking them to accept us, asking for their continued love and care. It’s the season for putting in place the supports we need to live differently. Spiritual winter is the season for moving from fear to resolve, moving from aimless anxiety to focused strategy. It’s the season in which we cease wandering in the wilderness and begin travelling in a definite direction. It’s the season for moving from confusion to clarity, from caution to courage. It’s the season for getting ready. But how? So many resolutions fall by the wayside. So many longings go unfulfilled. So many habits remain unbroken. So many truths remain unspoken. How do we do the work of our winter seasons well so that change comes in spring? Here’s what I know: If I’m an addict and I resolve to break my addiction, I am unlikely to succeed if I give up the substance but try to continue being the person I’ve always been. Breaking the addiction is not simply a matter of giving up the substance. I’ve got to let go of the self I was in relation to the substance. In that way I can create sufficient space for a new, non-addicted self to emerge. If I receive a diagnosis of cancer, and I resolve to enter into treatment with the intention of beating that cancer, I am unlikely to succeed if I try to continue my life as it was prior to the diagnosis. There are aspects of my living I must let go of in order to effectively fight the cancer. If I resolve to be a better parent, I am unlikely to succeed if I try to add better parenting techniques on top of my previous mediocre parenting techniques. I have to let go of my previous techniques. I have let go of the parent I was in order to become the parent I want to be. I have to create sufficient space for new techniques. I have to create sufficient room for my new identity to emerge. If I resolve to repair a broken relationship, I am unlikely to succeed with a simple “I’m sorry” or “let’s be friends.” If I have played a role in the breakdown of the relationship, at some level I must let go of that part of myself that played the role, and in so doing create space for a new self to emerge, one that understands how my previous self contributed to the problem and is therefore able to avoid the problem in the future. Friends, the new year has arrived. The planet slowly tilts its northern hemisphere back toward the sun. Though day-light hours begin lengthening, the long, evening shadows still arrive early. The land, still barren, the branches still leaf-less. Emptiness abounds. Perhaps there is a change you’ve resolved to make with the turning of the year. Perhaps a change has been forced upon you. Either way, in this winter season, and in all your spiritual winters, may you find your way to emptiness, to beholding the ‘nothing that is.’ This is subtraction. This is what is necessary to let go of unnecessary attachments, to let go of old habits, of old routines, of old practices, of old selves. This is what is necessary to welcome the new. This is the work of winter that gives rise to the promise of spring. Kingsolver, Barbara, Animal, Vegetable, Miracle: A Year of Food Life (New York: HarperCollins Publishers, 2007) p. 297. Simmons, Philip, Learning to Fall: The Blessings of an Imperfect Life (New York: Bantam Books, 2000) p. 116. Pappas, Stephanie, “Why We Make New Year’s Resolutions,” Livescience, Dec. 31, 2013. See: http://www.livescience.com/42255-history-of-new-years-resolutions.html. For more information on watch night services, see Durden, Jada, “Watch Night, a Time of Renewal, Celebration,” Shreveporttimes. Com, Dec. 31, 2014. See: http://www.shreveporttimes.com/story/life/community/2014/12/31/watch-night-time-renewal-celebration/21110623/. Schmidt, Leigh Eric, Consumer Rites: The Buying and Selling of American Holidays (Princeton: Princeton University Press, 1995) p. 117. Schmidt, Consumer Rites, pp. 117-118. Schmidt, Consumer Rites, p. 118. Simmons, Learning to Fall, p. 110.